As I am writing this post, the popular MMORPG The Lord of the Rings Online has been offline since 2:00 AM EST on 6th March (7:00 AM GMT). The game servers, website and account portal are offline for maintenance and it would appear that the actually physical hardware is being relocated within the datacentre that Standing Stone Games uses. Like any complex IT project of this nature there are always potential problems and it would appear that some have occurred as the initial 22 hours projected down time has now become nearly 3 days. Naturally this has had an impact upon the LOTRO community as Friday evening is often prime gaming time. From SSG’s perspective the extended outage is not good for business or community relations and so they have been using social media to keep players informed. I wrote recently about how I wished that lifetime subscriptions were still available for the MMORPG, The Lord of the Rings Online. I explored the value of such deals and concluded that the ongoing revival of the game, especially with regard to the launch of the progression Legendary Servers, presented the developers with the perfect opportunity to offer something similar to new players. Oddly enough, Standing Stone Games have just announced the LOTRO Legacy Bundle, which although not a lifetime subscription, offers a substantial quantity of game content and bonuses at a substantially discounted price. Here is a breakdown of what is on offer. I have written in the past about the quality of the soundtrack for the MMO The Lord of the Rings Online and how it is far more than an embellishment to the game but a character in itself. Now the developers of LOTRO Standing Stone Games (formerly Turbine) have released over the years a variety of soundtrack CDs and digital downloads, offering a selection of music usually associated with specific expansions for the game. Although these have been well received, they have only provided a percentage of the music that is present in the current release of LOTRO. In the latest build there is approximately 4GB of audio in the game. Admittedly some of this will be dialogue and ambient sounds but the majority of that is music cues in .ogg format. I sure I’m not the only LOTRO aficionado who would like to see a more comprehensive release of the games musical content. First off, fellow blogger Wilhelm Arcturus wrote a blog post that predicted pretty much everything that happened today, with regard of the launch of the new Legendary Servers. Yes, you read that right. Servers, plural. Apparently, there was so much interest in Anor, it led to massive login queues, so Standing Stone Games very quickly set up a second Legendary Server named Ithil to deal with the over flow. To ensure that folks get to be with their friends and kinmates, there’s also a free transfer grace period. I guess there’s no such thing as a smooth launch, be it a new game or a variation of it. The more cynical among us, may even go so far as to postulate that the server queues were planned to generate a “buzz” and the “need” for a second server. However, it’s more likely that SSG just miscalculated and had to think on their feet. There could well be server merges ahead when the excitement, queues and possibly player numbers die down. Either way, the job is now done and LOTRO now has two progression servers. Standing Stone Games announced today the launch of a new LOTRO "Legendary Server" later this autumn. This is essentially a progression server by any other name. It will be accessible to VIP monthly and lifetime subscribers allowing access initially to core content from levels 1 to 50 via The Shadow of Angmar story. It should be noted that this is not “classic” LOTRO as it existed back in 2007. The new server will offer the game as it is now with all its revised systems. Hence High Elves and Beorning classes will be available as will the skills tree system. SSG intend to update content every four months but will keep it all within the parameters of the level cap on the"Legendary Server". The developers have also made it clear that this new service does not come at the expense of regular new content for the existing game. “We have no intention of adjusting our frequent, regular, and active development of the non-Legendary game worlds, and have plans for them well into the future”. Back in December 2008, I bought a “compilation pack” that contained both the The Lord of the Rings Online: Shadow of Angmar base game, along with the newly released Mines of Moria expansion. I paid £20 for the lot. After the obligatory free months access, I then became a regular subscriber right up until about summer 2012. Since then I’ve subscribed and played whenever new content is released, meaning that for about six months of the year, I’m paying for the “luxury” of playing LOTRO. I’ve also purchased all the expansions over the years. Because I enjoy the game, I am not averse to buying additional LOTRO points when my monthly stipend doesn’t cover the cost of the items I want. I never availed myself of the opportunity to become a lifetime account holder, which is something I regret. It certainly would have been very good value for money, considering that LOTRO is over a decade old. Over the past eleven years The Lord of the Rings Online has faced many business-related issues that has prompted its player base to speculate over the games future. These include the MMOs transition from a subscription to a free to play service, Turbine’s acquisition by Warner Bros. Interactive Entertainment and then there were the issues with the license expiration in 2017. However, all these problems were resolved in one way or another and the game endures. That is not to say that Turbine or Standing Stone Games (SSG) are business geniuses. Absolutely not. They’ve made plenty of mistakes over the years and continue to regularly shoot themselves in the foot with their community relations. LOTRO survives because of its core playerbase who have made this virtual Middle-earth their home and they support the game come hell or high water. A lot of this core group are fully aware of SSGs shortcomings, but they are wedded to this game and hence they sustain it. It’s a curious yet fascinating symbiotic relationship. I bought the Mordor expansion for LOTRO in August but apart from playing through the prologue, I made no further progress. I was getting somewhat burnt out with MMOs at the time, so I decided to take a break and pursue other games. I was prompted to return to the LOTRO today by the recent Executive Producer’s Letter from Rob Ciccolini and the announcement that Update 22, coming in 2018, takes the story to Northern Mirkwood. Iconic locations such as Thranduil's Court, Dale, Laketown, and Erebor will feature in the epic story. Looking further ahead another future destination is Minas Morgul and a showdown with Shelob, who so far, we’ve only met briefly from a first-person perspective in a cut scene. Naturally I’m interested in where Standing Stone Games takes the story next, so I need to ensure that I have reached level cap by the end of the year, which isn’t that far away. Hence, it’s back to Mordor. Shame I don’t like Mordor. I’m not currently playing LOTRO but it hasn’t escaped my notice that there’s been a “wee stooshie” this week regarding Standing Stone Games handling of the “Incomparable Gear” debacle. To summarise, the cost of some specific high-end gear was set too low (about 75% cheaper than it should have been). Naturally, players bought these items from the barter vendor in good faith. Once the error was discovered, SSG’s initial solution was to patch the game and remove the item(s) from those who currently had it, without adequatecompensation. Naturally this was not well received by those affected by the issue, many of whom had bought the new items, then broken down and asset stripped the gear it was replacing. Drama, rancour and poor public relations ensued, further damaging community relations between SSG and the LOTRO player base. It should be noted that SSG is still trying to recover from the last marketing blunder they made back in July when they announced the profligate pricing range of the Mordor expansion. Well, I waited till this afternoon before buying the Mordor expansion for LOTRO. Unlike the song, a day really didn’t make that much difference. In true and traditional Standing Stone Games style there were still problems, glitches and hassles to be found twenty-four hours on from the launch. In fact, there’s a hot fix to be deployed tomorrow to iron some of these out. Yet, in spite of all these minor niggles, tonight I found myself officially entering Mordor, ten years after the launch of LOTRO and eight years on from my subscribing to the game. I must admit as the game wrapped up the original story and I said cheer-bye to Frodo and the rest of The Fellowship of the Ring, I did feel a sense of great satisfaction as I reflected on what my character had achieved on behalf of the free peoples of Middle-earth. Why even Gandalf himself thanked me for my courage and effort. And then a message appeared in chat, stating “You’ve earned 5 LOTRO Points”. The irony wasn’t lost and I then went on to ponder exactly why I’ve spent years being a butler to all the NPCs I’ve met in LOTRO. Standing Stone Games: Is the Honeymoon Over? I was not that surprised when Standing Stone Games announced that their Mordor expansion for LOTRO would be released at the end of July, just weeks after several open beta tests. This is something the developers have done for a while, with all their major updates. One has to remember that despite a change of name, to core team developing LOTRO has not radically changed since they extricated themselves from Turbine. Something that SSG went out of their way to stress when they formally announced their move, last December. The press releases and interviews at the time focused on a sense of continuity and implied that SSG was now free from the corporate yolk of Warner Bros. and Turbine. 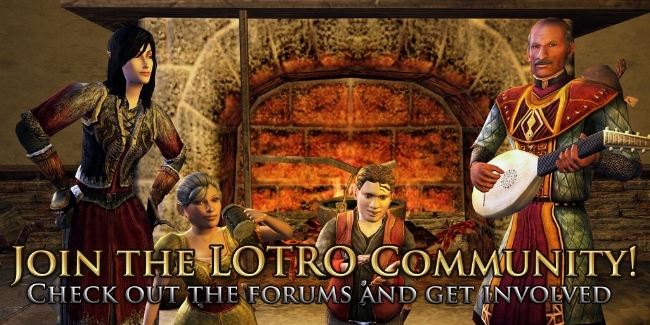 It led to a great deal of optimism among LOTRO players and sparked a resurgence in the game. The fact that the MMO has now reached the end of Tolkien’s story and is about to embark upon its own original narrative has been well received. Yet LOTRO has always been regarded both by the faithful and by those outside, as a game that never quite lived up to its potential. Perhaps the release of Mordor would remedy that? It was announced yesterday by the Daybreak Game Company that the MMO Landmark will be closing on 21st of February. Landmark joins an ever-growing list of titles that have closed since DGC acquired SOEs back catalogue. As ever the press release does not give any specific details as to why the game is to be shutdown. However, it is more than likely down to operating costs versus profits. Furthermore, irrespective of the corporate reasons for the decision, there are still numbers of Landmark players who will be saddened by the news. This development is also of interest to LOTRO and DDO players, due to the Daybreak Game Company recently becoming the publisher of those titles. To date one of LOTRO’s greatest weaknesses has been the way it’s been run and marketed. There are other flaws but these have been fully discussed over the years, so I see no reason to revisit them. Considering the games pedigree, the nine-year-old MMO has never reached its full potential but that is a criticism that can be levelled at many entries in this genre. In recent years LOTRO has limped forward, hobbled by an ever-diminishing development team and starved of resources by its corporate master. Yet because of the dedication of a core group of fans the game generates sufficient revenue to keep it from folding. Thus, despite continued predictions of closure from armchair experts such as myself, LOTRO endures, while other titles have sailed into the West.